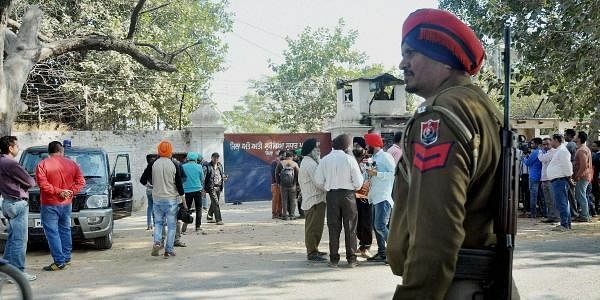 Two close aides of Nabha jailbreak mastermind Parminder Singh alias Penda have been arrested here with police suspecting that the incident may have been plotted at their hideout in the city. DEHRADUN: Two close aides of Nabha jailbreak mastermind Parminder Singh alias Penda have been arrested here with police suspecting that the incident may have been plotted at their hideout in the city. Geeta Arora, wife of Penda's friend Sunil Arora with whom the jailbreak mastermind was staying in a rented accommodation in the city's Raipur area and an aide Aditya Mehra were arrested from their hideout yesterday, SSP Sadanand Date said. However, Sunil Arora along with another accomplice managed to escape, he said. Sunil is a close friend of Penda who was staying with the Aroras for six months till he left the city five days ahead of the jailbreak to execute it. Date said the jailbreak in all likelihood was plotted at their hideout in the city. Several fake vehicle number plates, voter IDs, sim cards, mobile phones, bullets, material used for making a bomb and Rs 2 lakh in cash have been recovered from the house where the duo was arrested, the SSP said. Khalistan Liberation Front Chief Harminder Singh Mintoo, who had escaped from Nabha jail in Punjab along with five other inmates on Sunday, was nabbed from Nizamuddin railway station here.